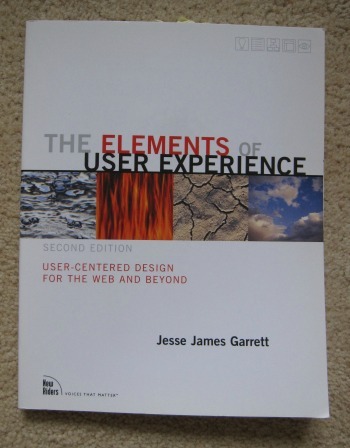 Today I am looking at Jesse James Garrett's The Elements of User Experience. If you are into UX and have not heard of Jesse James Garrett go look him up now! His book written over 10 years ago, but now on its second edition, looks at the core principles for web and interaction designers. But more importantly it looks at how you balance all the parts of a good website, clean code, great content, strategic objectives and a list of user needs to create a great website out of chaos. Garrett focuses more on giving readers the big picture rather than tools and techniques, but if you can keep the big picture in mind while designing it really helps the end result. The book introduces the elements of user experience framework which is made up of five planes - strategy, scope, structure, skeleton and surface. The idea being that for each project you work on you will need to consider all of the planes to succeed. When you look at it, you will probably find you were covering most of the planes already in your work, but by considering that one you were not aware of and how they all fit together, you can make your product even better. This is a slim book but it holds some big ideas, and while it was a quick read there was a lot to think about by the time I was done. I can not say it was an easy read as some of the concepts take some thought to understand, but Garrett makes it as easy as possible and includes plenty of diagrams to help you along. Having read this at a time when I was working on websites, I think it might be quite interesting to read it again now I am working on mobile to see if the principles still work. If you are finding it hard to communicate why UX is important and should be a strategic function in your company, this book might well help you to explain your ideas better.